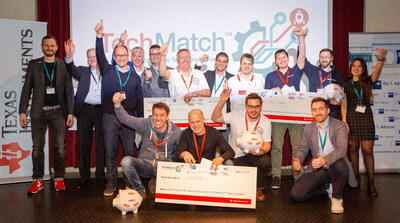 MUNICH, March 5, 2019 /PRNewswire/ -- Twelve start-ups entered the race for prizes totaling over €30,000 ($34,000) at the TechMatch start-up competition run by semiconductor manufacturer Texas Instruments (TI) and partners including Digi-Key Electronics, a global electronic components distributor, on January 31, 2019 in Bielefeld, Germany. During the event, companies gave short presentations detailing their industrial hardware projects and then answered questions from an expert jury of industry experts as well as the audience. The projects are judged and evaluated on business case, technical innovation, manufacturing process, and digital marketing. "Our event series TechMatch is part of TI EMEA's market strategy to discover and support promising start-up companies, win them as customers and grow together," says Matthias Knaup, Area Director Industrial Central Europe at Texas Instruments. "The overall performance of the 12 participating teams has given proof that Germany, and especially the region of Bielefeld, is home to technological innovation that addresses real world challenges the manufacturing industry is facing. We thank all partners, especially Digi-Key, and participants, for making TechMatch a success." 1st Place: Clevabit uses sensors with a modular hardware and software solution to collect data on animal husbandry such as medication delivery or room climate in the barn. The data is recorded and evaluated via an app – and can then be optimized to suit the welfare of the animals. It's like Farming 4.0. 2nd Place: Motion Miners Motion Mining allows automatic analysis of manual processes. Using sensors and machine-learning algorithms, motion miners gather reliable data on ergonomics, productivity, and efficiency - revealing potential for improvement. 3rd Place: The CAE SoundCam is the first camera to create acoustic images and is affordable for everyone. The system is intuitive and as easy to use as a smartphone. SoundCam localizes sound sources in real-time and displays the results on the screen. "Being a 47-year-old start-up, TechMatch was the perfect match for Digi-Key," said Hermann Reiter, Director of Global Strategic Business Development & Supplier Management at Digi-Key. "I loved the energy in the hall which was performed in a former SPINNEREI, or spinning mill. The word 'Spinnerei' in German means 'Madness', but I did not see any madness – rather highly professional, enthusiastic start-up companies with the willingness to change the status quo and to drive innovation with a passion utilizing electronics." To order from Digi-Key's wide breadth of electronic components, please visit the Digi-Key website.